If you are looking for more power and speed, then you should buy a Lamborghini. Errr, I mean try these fairway woods made out of a Lamborghini. I do not jest. 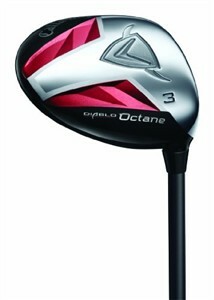 The material used in these clubs is a revolutionary new material that Callaway and Lamborghini came up with together. While Lamborghini is using it to make cars, Callaway is using it to build faster, stronger, more precise golf clubs. The material is a forged composite. This is actually bundles of microscopic carbon fibers held together with resin. The material is heated until it liquefies, and then Callaway creates the desired shape. The light material allows Callaway to move weight back and low, creating the highest MOI and deepest center of gravity of any golf club. What that translates to in a fairway wood is a club that is very forgiving and gets the ball up fast off of an extremely hot club face for longer distance. You can get these fairway woods in the Standard model designed for playability and distance, or the Tour models which are more workable. If you like the woods, make sure you check out the drivers: the Callaway Diablo Octane Driver and Callaway Diablo Octane Tour Driver.